Here's another hat for my shop, made with brown, gold and white mix of wool and cotton yarn and embellished by a huge flower circle applique! There's no pattern for this because I use to work by sudden inspiration and this one was made yesterday while watching television! I post it anyway, always hoping that you can find some ideas here for your crafty works. As usual you can contact me for any question and for helps on making something similar to this. 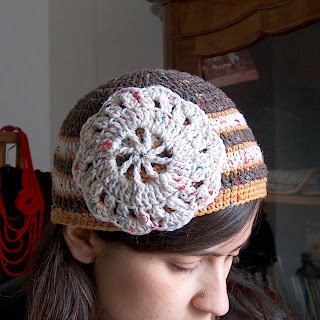 I think this is so romantic, and I'm planning to make more hats with this flower detail.